Ryan was in a tragic accident from falling off a golf cart and hitting his head in just the wrong way, which resulted in a traumatic brain injury. Today, Ryan is working hard in rehabilitation therapy but his parents need your help as they struggle with the financial reality of having a son in this situation. 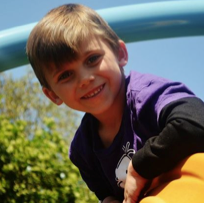 On March 30, 2014, Ryan was airlifted to Arnold Palmer Hospital for Children where he spent approximately two weeks in the Pediatric Intensive Care Unit (PICU). On April 16, Ryan was transferred to Brooks Rehabilitation in Jacksonville (~3 hours from their home). While at Brooks, Ryan is receiving intense daily therapy, while his mom, Dawn, is learning more about his brain injury and how to cope with these changes. Over the last two weeks since the transition, Dawn has remained in Jacksonville with Ryan. She will continue to do so during Ryanâ€™s lengthy rehabilitation. Her husband, James, has stayed home with their 11-year old daughter, Hailey, trying to keep her life as normal as possible. The road ahead will be long and challenging, but Ryan and his family are strong and will never give up. Thankfully, Ryanâ€™s family has health insurance, but not all of his medical expenses are covered. Travel back and forth to Brooks, co-pays, medications and more add up. Additionally, Dawn is an elementary school teacher who quickly used up her sick days. Her lengthy time away from work is â€“ and will be â€“ unpaid. Ryanâ€™s parents are living on one income now and for the foreseeable future. To help with the costs of Ryanâ€™s injury-related expenses, a fundraising campaign in his honor has been established with HelpHOPELive, a nonprofit organization that has been assisting the transplant community for 30 years. In 2000, they expanded their mission to include those who have sustained a catastrophic injury. All contributions are tax-deductible, are held by HelpHOPELive in the Traumatic Brain Injury Fund, and are administered by HelpHOPELive for injury-related expenses only. To make a charitable contribution, select the “Donate Now” button or see the “Mailing a Check?” box on the right side of this page. On behalf of Ryan Boyd and his family, thank you for all your help!